Medical schools and teaching hospitals demonstrated readiness for crisis situations. Over the past several weeks, faculty, staff, students, and residents at medical schools and teaching hospitals devastated by Hurricanes Harvey, Irma, and Maria have been working around-the-clock to help their communities recover. Members of the AAMC Leadership Team have been in contact with medical school deans and teaching hospital CEOs throughout Texas, Louisiana, Florida, and Puerto Rico to offer support. “Given the unprecedented events after Hurricane Maria, we have been in frequent communication with the four LCME-accredited U.S. medical schools in Puerto Rico,” said John Prescott, MD, AAMC chief academic officer. As deans from Puerto Rico’s four medical schools assess the damage and try to communicate with their students, the immediate priority is to address the medical and public health needs of Puerto Rico’s residents. The schools are in various stages of reopening and are continuing to have difficulty with basic services, including phone and internet. Over the coming weeks, deans from the schools—Ponce Health Sciences University School of Medicine, San Juan Bautista School of Medicine, Universidad Central del Caribe School of Medicine, and University of Puerto Rico School of Medicine—will prioritize the needs of their students. Prescott noted that leaders at several AAMC member institutions across the country have expressed a desire to support colleagues in regions impacted by the hurricanes. The AAMC is providing regular updates about hurricane response efforts on its website. The AAMC also made a contribution to the American Red Cross to support hurricane relief efforts. Eduardo C. Alfonso, MD, (at left in white shirt), director of Bascom Palmer Eye Institute, and other leaders join families in celebrating three children’s birthdays during the storm. Credit: University of Miami Miller School of Medicine. “After medical and health needs are addressed and the deans have had a chance to assess their situations, the AAMC will reach out to our other member institutions to determine how we can best support our colleagues in Puerto Rico,” Prescott added. “LCME staff have been advising the AAMC on how to support the education of the approximately 1,300 medical students across these four schools.” In the 2016–2017 academic year, the four schools enrolled 1,394 students, and 271 students graduated from the institutions in 2017, according to AAMC data. The four medical schools in Puerto Rico, all of which are AAMC members and fully accredited by the LCME, educate physicians who help contribute to the diversity of the physician workforce and will be able to provide culturally competent care to Spanish-speaking populations. In addition, the schools have a special mission to address community health needs in Puerto Rico, and have overcome challenges related to size, limited funding, and a location separated from the mainland, according to an article originally published in the AAMC Reporter in 2015. Regarding health and safety, the AAMC has emphasized to the four deans that it will provide help in whatever way it can. The AAMC is communicating with the deans in Puerto Rico regarding their urgent needs, damage sustained, location of students, current challenges, and daily progress, and is working to help students who are applying for residency or medical school or who have registered for the MCAT® exam. In addition, the AAMC is sharing information with medical school deans and other academic leaders on the mainland and working closely with the LCME and other stakeholder organizations, such as the Accreditation Council of Graduate Medical Education (ACGME). 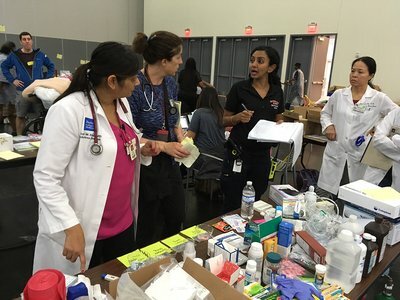 Shital Patel, MD, from Baylor College of Medicine and other medical professionals treated patients who took shelter at George R. Brown Convention Center in Houston after Hurricane Harvey. Credit: Baylor College of Medicine. In Texas and Florida, academic medical centers demonstrated their ability to respond to crisis situations. “Years of planning, practicing the plan and then proactively following the storm allowed our teams to safely care for our patients, our facilities and one another,” said Matt Berkheiser, associate vice president and chief safety officer for environmental health safety and corporate services at The University of Texas MD Anderson Cancer Center. At Florida International University (FIU) Herbert Wertheim College of Medicine, an everyday part of the curriculum became a key piece of the response. As participants in the college’s NeighborhoodHELP program, students provide primary and preventive services throughout the community in mobile health centers. After Hurricane Irma passed through, teams used the centers to provide care for those in need. “This is our medical school’s mission in action, and I think this proves you can use an institution of higher education to help a community become more resilient after a disaster,” said John A. Rock, MD, founding dean and vice president for health affairs at FIU. Several medical schools and teaching hospitals in affected areas responded by mobilizing crisis plans and developing creative solutions. In the aftermath of Hurricane Irma in Miami, the Herbert Wertheim College of Medicine deployed a volunteer team to West Kendall Baptist Hospital to treat patients as they arrived at the hospital’s emergency department. At the University of Miami Health System, teamwork among 105 physicians, nurses, administrators, and other staff enabled the hospital to continue delivering most services. 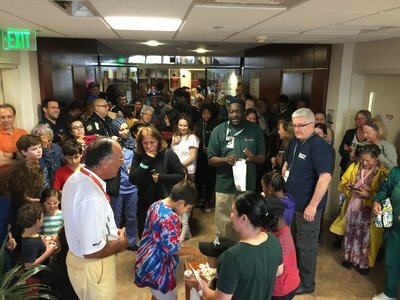 In addition to treating hundreds of patients, staff held an impromptu birthday party for three children whose parents were working during the storm. At Baylor College of Medicine in Houston, several faculty members mobilized before Hurricane Harvey left the area and organized groups of physicians and other professionals to treat patients at shelters. In addition, Victoria Mitre, a fourth-year medical student at Baylor, started a Facebook group to organize student volunteers who began working at clinics as they reopened and gathering donations immediately after the storm. About 10% of faculty, staff, and students at Baylor had significant damage to their homes or cars during the storm, according to Claire Bassett, Baylor vice president of communications and community outreach. 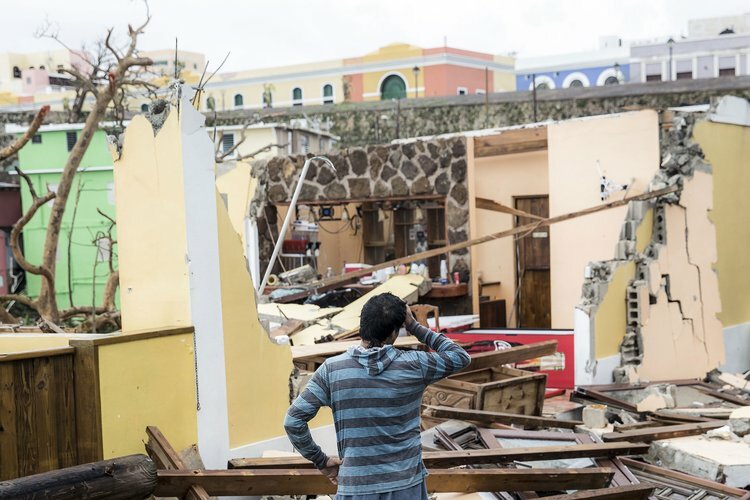 The school organized teams that helped those with damaged property begin to clean up, and organized a fund to help with the financial costs of rebuilding. More than 1,500 health care team members from University of Florida (UF) Health and UF Colleges of Medicine responded during Hurricane Irma. Many emergency services remained open throughout the storm. UF Health Shands hospital system made arrangements for more than 1,000 faculty, residents, and staff to stay overnight at the hospital to ensure the 800 inpatients received care. Faculty and students at UT Southwestern Medical Center in Dallas, made plans to care for evacuees from Houston following Hurricane Harvey. Volunteers triaged patients, provided medical supplies, and helped arrange for donations and blood drives. A month after Hurricane Harvey, UT Southwestern announced it will provide free telemedicine services to Texas residents affected by the hurricane through the video and text messaging app Cirrus MD. Pediatricians from Baylor College of Medicine helped with rescue efforts after Hurricane Harvey. Credit: Baylor College of Medicine. Although recovery efforts are underway, people in the affected communities could experience emotional effects from the storms for years to come. 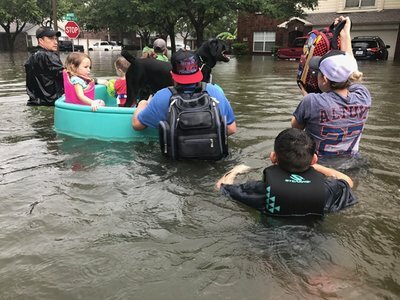 On average, about 4% of people who experience a natural disaster develop post-traumatic stress disorder, according to Carol North, MD, a crisis psychiatrist at UT Southwestern Medical Center who has studied the effects of disasters. “Everybody who has been in a disaster is changed permanently in some way. You never forget it,” North said in a news release.